A seminar event for introducing awamori to South Korean buyers was held at the izakaya Kobachi in the Gangnam Finance Center in Seoul on September 24. The Seoul office of the Japan External Trade Organization held a seminar event at Gangnam Finance Center in Seoul on September 24 to introduce the Okinawan alcoholic beverage awamori to local hotels and izakaya or Japanese style taverns. A total of 16 South Korean buyers attended the event. 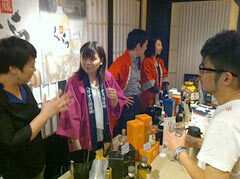 Helios Brewery took part from Okinawa, introducing the drink and holding a tasting session. The company will officially ship the awamori brand Kura to South Korea from the beginning of October.